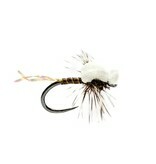 When the fish are keying in on midges, do not hesitate to tie this one on. Unique foam back make it both more visible and buoyant. Tied on a size 16 barbless hook.